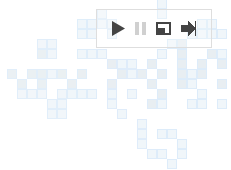 Search on Google for [conway's game of life] and you will find Google's latest Easter Egg. It is a geeky game that needs no intervention. It is actually known as the "Game of Life," it is a cellular automaton devised by the British mathematician John Horton Conway in 1970. The "game" is a zero-player game, meaning that its evolution is determined by its initial state, requiring no further input. One interacts with the Game of Life by creating an initial configuration and observing how it evolves. This is pretty neat, don't you think?